Comments Off on Why Do 1 in 4 Businesses Plan to Upgrade Their ERP Software in the Next 12 Months? Why Do 1 in 4 Businesses Plan to Upgrade Their ERP Software in the Next 12 Months? In the late 1990s, many businesses upgraded their ERP software systems or bought new ones in order to avoid the ominous Y2K disaster. Those ERP systems were big, required even bigger hardware, and were ridiculously expensive. As time passed, it became increasingly difficult for these companies to hold onto their dying ERP systems, but it was also too costly to upgrade or switch to new ones. All of that has changed in the past few years, and there are now a variety of options for ERP deployment that can make upgrading easier and less costly over time. According to a report by InfoWorld, small to medium businesses (SMB) and enterprises looking for ways out of their legacy ERP dungeons have taken notice, and as many as one in four of them say they plan to either upgrade or implement a new system in the next 12 months. Some companies spent millions implementing complex ERP systems that did not fit their businesses models, forcing costly customization and time-consuming workarounds. As they peer into the future, they want to find ERP software that will be flexible and customizable but also have simplicity in its implementation. 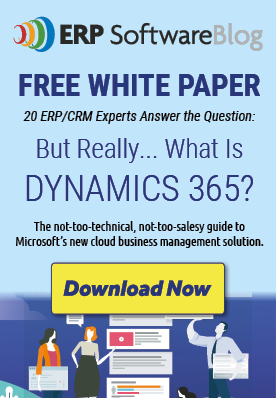 The answer is Microsoft Dynamics GP for flexible affordable ERP software. Microsoft Dynamics GP is a richly featured business management system built on solid Microsoft technology that can be deployed quickly and customized easily. Alternative deployment options also put pressure on the traditional on-premise vendors to offer ERP systems that are easier to implement and less costly to adopt. Moreover, some companies, such as Microsoft, are moving toward multi-faceted implementation models that allow customers to mix and match on-premise, hosted, and cloud software. With so many affordable options, now is the right time to look for new ERP software. InterDyn BMI can help – contact an InterDyn BMI office in Minnesota, Texas, Montana and South Dakota. Posted in About Microsoft Dynamics GP, Compare Accounting Software Packages | Comments Off on Why Do 1 in 4 Businesses Plan to Upgrade Their ERP Software in the Next 12 Months? Infográfica: 10 Ideas Brillantes para Aventajar a su Competencia con Microsoft Dynamics ERP.